The Winter 2014 issue of the Lefferts Manor Echo newsletter is available now for downloading. 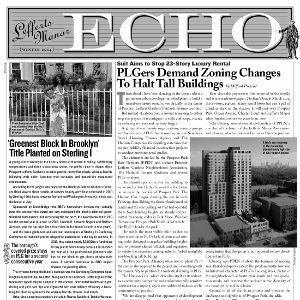 It is full of great stories, such as the lawsuit filed to prevent construction of a 23 story luxury rental building on Flatbush, as well as articles on PLG residents, local retailers, and PLG’s winner in the Greenest Block in Brooklyn contest. Copies will be available at local retailers.